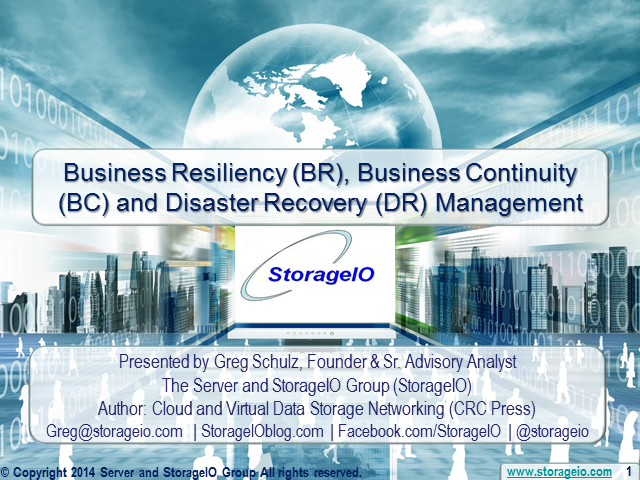 Assuming your environment has implemented a business resiliency (BR) strategy and plan that includes business continuance (BC) and disaster recovery (DR), how are you managing those? Are the tasks and activities involved with support BR, BC and DR integrated as part of your normal processes, procedures, best practices, or are they after the fact or done when needed? One of the ways to reduce the cost of BR, BC and DR is too remove complexity which can be tied back to various processes and activities that range from maintaining and making updates to plans as well as testing. For example if you are practicing BC and BR functionalities as part of the every-day course of doing business you may already be removing costs. On the other hand, if you are spending time and money preparing to pass quarterly or annual audits and BC, BR and DR readiness, you may be incurring additional costs. This webinar looks at streamlining your BC, BC and DR management including making sure you have proper coverage of applications, data, systems and settings. •Do you know who well your applications are protected, to what level and cost? Join us for this 45 minute webinar on 7th June at 10am UK that will ensure that your Business is Seamlessly Up and Running in Minutes. Understand how Ultimate Damage Limitation for Cyber-Attacks is Achieved through Business Continuity within Software-Defined Storage. Severity of cyber-attacks are judged by the length of time critical systems, data and applications are down. The ability to have a Business Continuity and Disaster Recovery enabled infrastructure mitigates the risk, offering zero downtime, zero Recovery Point Objective, and seamless rollback in time to the point before the attack hits. Your host for the meeting, Garry Carpenter has immersed himself in all things business continuity for the past few decades and is one of the leading UK authorities in the field. Businesses today rely heavily on their data. Disaster may strike anywhere and occurs in many shapes and sizes. Transporting data over significant distance beyond the reach of a threatening event preserves data so organizations can rapidly recover in the event of a site going down. This makes deploying a disaster recovery infrastructure between data centers with fast, continuous, and easy replication of mission-critical data to anywhere in the world essential. Fibre Channel over IP (FCIP), often referred to as “Extension,” is used to connect SANs across distance using IP networks. FCIP is commonly used for Remote Data Replication (RDR) between Enterprise Storage Arrays and Remote Tape applications, for the purpose of Business Continuance via Disaster Recovery (BC/DR). The devastating impact of Hurricanes Harvey and Irma across Texas and Florida will continue to live long after the waters have receded. How are enterprises, small businesses, government agencies and non-profit organizations prepared for the disruption caused by Harvey and Irma? If anything, these hurricanes are a stark reminder that all organizations need to have a disaster preparedness and business continuity plans in place to help with recovery from major natural catastrophes. Is your security architecture up to date and able to defend against the latest cyber attacks? Every technology vendor will likely tell you that they have the most solid infrastructure, and that their roadmap is the one to follow. You may want to consider a fault-tolerant approach with security, as it can be more comprehensive than selecting one particular vendor for a specific requirement. Fault-Tolerance means that you assume that a particular solution will fail, but are theoretically protected as another solution can be there if this failure happens. Join this presentation and learn how fault tolerance can be deployed against breach scenarios and how it helps improve cybersecurity in 2017. In light of recent data breaches and the increasing cost of a breach, it is clear why good IT and cybersecurity management is key to your business, especially when it comes to Business Continuity and Disaster Recovery planning. Join this presentation and learn about the human error in breaches, as well as what managers should know about their IT environment. Learn the steps you need to take today to ensure the right BCDR plans are in place before a disaster strikes. Come prepared to look at disaster recovery planning with a 360 degree view for the enterprise and SMB space, and walk away with technical ideas you can begin to implement immediately. During this presentation, we will discuss disaster recovery planning considerations and partnerships. We will also walk through technical solutions that provide a way to use virtualization and storage strategies for an approachable DR solution. James Chillingworth, Founder (CEO), The Consulting Practice Inc. Learn how your organization can achieve better data protection through leveraging fault-tolerant technology. Cybersecurity expert James Chillingworth will review how applying hardware architecture concepts, in addition to other abstractions can form the framework for developing software that becomes more robust, reliable, expandable and secure. By implementing this, organizations can better protect their applications, data, databases, and improve security, operability, code quality and redundancy. With the healthcare industry experiencing a dramatic increase in the volume of successful ransomware attacks, it is critical that organizations upgrade their security policies and approach. This means understanding the evolving cyberattack landscape and developing effective strategies to protect the integrity of systems, applications, and data. A critical aspect of that strategy is proactively identifying employee email credentials that have been compromised. In our 2016 benchmark study of healthcare firms, Xtium and ID Agent recently found that 65% of firms analyzed have employees with visibly compromised accounts. These findings illustrate the need for ongoing monitoring as well as 100% reliable and responsive business continuity solutions. The urgency stems from the fact that stolen health records are worth more than 10 times the value of stolen credit card numbers. The FBI recommends combating these cyber-threats by establishing a solid business continuity plan which includes the regular creation of secure, isolated data backups. This presentation will a) explore the common misperceptions and security holes that can lead to ransomware vulnerability, b) discuss the study results and the measurable ongoing threat represented by compromised email accounts, c) compare the various alternatives for responding to cyberattacks, d) explain the pros and cons of cloud-based security and backup strategies, and e) provide real-world case study examples of how recent ransomware attacks have been quickly and successfully resolved. Both production and non-production landscapes are massively effected by the rewritten laws of physics in the cloud. One opportunity of Cloud Native Enterprise Architectures is to redefine the approaches to Business Continuity and Disaster Recovery. Using SAP workloads on AWS as example we will show how and why enterprises run different than before and how Disaster Recovery needs accelerate all in migrations to the cloud. Data is the new currency. It is the gold waiting to be mined, the oil waiting to be refined, and the resource waiting to be taken for ransom or stolen for its intellectual property. Wait, that last piece didn’t rhyme. And that lack of rhythm and rhyme is why data recovery is evolving from naturally occurring events i.e. system failures and natural disasters to unleashed beasts such as social-engineered phishing attacks and schemes designed to take your data hostage. In this session, we’ll discuss how to monitor with discipline in order to protect your data protocol with effective and efficient process management. · What is monitoring with discipline? · How do I optimize my backup and recovery process? · How can I extend my current data recovery protocol to encompass ransomware protection? Although most organizations have been performing elements of IT disaster recovery for years to decades, it’s still common for organizations to struggle to ensure alignment between IT capabilities and business application recovery needs. Even if IT exercises run flawlessly and meet planned recovery capabilities, there often remains gaps between the business requests and IT committed capabilities. This can inhibit organizations from having effective (yet reasonable) strategies in place that meet all stakeholder expectations. This presentation will explore potential methods organizations can execute to help all groups in the disaster recovery process understand each other’s intent, priorities, dependencies, needs, and considerations, as well as the impacts of system downtime. These methods seek to truly synchronize business continuity and IT disaster recovery by enabling ongoing discussion, understanding and insight, continued coordination, and communication. Taking such measures will ensure an effective IT disaster recovery program that meets the expectations of all stakeholders. In the case of a failure, do you know how long it will take to restore your database? Do you know how old the backup will be? In this presentation, we will cover the basics of best practices for backup, restoration and business continuity. Don’t put your company on the line due to bad data retention and backup policies. Digital transformation is the process of using today’s technology to modernize outdated processes and meet the most pressing needs of your business. Thanks to recent advances in lower cost tablet technology and Microsoft’s suite of cloud and productivity services, complete digital transformation is more accessible now than ever before. A new class of affordable devices is revolutionizing the way businesses and their employees work and interact with customers. It’s critical to know what is going on inside your network, what technology is being snuck into your firm, and how to educate employees about security precautions. IT management has a clear responsibility to protect, defend and remain vigilant over all systems and it doesn’t stop at antivirus on the desktop and a firewall to the Internet. Melinda Rahe, Business Continuity Program Manager Dell, Inc.
Outsourcing shifts the burden to mitigate risk to the vendor. But, it does not shift the impact of the risk. Your company’s reputation and its’ customers can be negatively impacted when your vendor experiences failure. Whether your nemesis is a malicious attack, a hurricane or (more likely) human error, have you collected all the tools you need to triumph and save the day? There are a host of technologies available to those prepping for potential business disruptions: backups on-premise, backups in the cloud, on-premise failovers, Disaster Recovery as a Service, and, of course, delivering an offering of cable and silicon to your mainframe every Tuesday at noon. With 10 years of experience leading the DRaaS and Backup market around the world, we’ve seen a lot of technologies come and go – and have some strong opinions and solid guidance for our customers on how best to evaluate options. Traditionally, when people talk about data protection, they’re talking about some form of backup. However, if those backups effectively end up in a “write-only memory”, they’re not much good. So really, the bottom line is recovery is what people are most concerned about when they talk about data protection. With the degree to which today’s technologies have been refined and the plethora of data protection platforms available, users should maintain a baseline set of simple expectations to be met no matter who or what they choose for the job. In this presentation, Taneja Group and Dave LeClair of Unitrends will discuss the “New Rules for Recovery” that everyone’s solution should adhere to. With the average company experiencing unplanned downtime 13 times a year, the costs associated with continuing to invest in a legacy backup solution can be extensive. For this reason, more customers are switching to Veeam® and Quantum than ever before. Update to a modern data center and achieve Availability for the Always-On Enterprise™ with Veeam coupled with Quantum’s tiered storage that increases performance, reduces bandwidth requirements and executes a best practices for data protection. With the unexpected nature of natural disasters and other disruptive events, preparation is key when it comes to disaster recovery and business continuity processes. Join this channel for live and recorded presentations featuring thought leaders in the field discussing current topics that will help you with tactical solutions to all your BCDR issues.